The only Raclette Cookbook you ever need! Our new cookbook has just been printed and is now ready to be shipped all over the world! 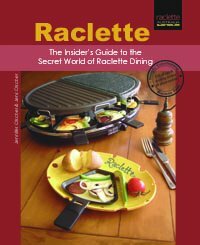 It is called Raclette - The Insider's Guide to the Secret World of Raclette Dining and is a hardcover, 96 page cookbook including of course the raclette history and raclette recipes. The original traditional Swiss Raclette Recipe is included plus raclette varieties and many more recipes, each with full colour photography. With this indispensible companion to the secret world of raclette dining your dinner parties will never be the same! This is the best thing to buy after or even before you buy a raclette grill. We can post this great cookbook worldwide. Ask us for prices in your currency and the postage costs to your country. Or order it right now in US$ for fast shipments from North America. Aside of many raclette recipes this cookbook also contains the history of the raclette meal, the raclette cheese and those great cheese melting machines commonly known as raclette grills. Enjoy every page of this 96-page hardcover, full colour raclette book from Raclette Australia. Buy our Raclette Cookbook and get it posted worldwide.